Breaching the Banqueting House. For Charridy, innit. One of the biggest frustrations of the year for me is not being able to get into the Banqueting House. Thrice I tried and thrice I was thwarted. 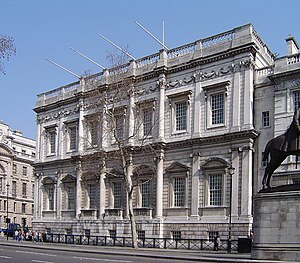 The early-17C Inigo Jones building on Whitehall was built by James I, the only surviving building from the old Whitehall Palace complex. The ceiling of the main hall was painted by Rubens at the behest of Charles I, who was executed outside this very building. On two occasions this year I went to Banqueting House during their stated opening hours to find it closed to the public. It would appear that BH are in the habit of renting out the gaff for corporate swankfests, worth far more than they can take on the door. My third failure was during Open House London weekend, when I mis-read the brochure – the all-important “Saturday Only” bit. But it’s a shame that some instututions don’t fully embrace OHL and open on Sundays too. I’m looking at you, Marlborough House and Benjemin Franklin’s House. Having bitched about the Banqueting House situation to every man and his hound, I was tipped off about a charity event there on 7 December. It’s a Christmas Fair for Save the Children, with 40+ vendors in attendance. Entry is £8 and includes a free glass of wine and canapés. It runs from 1pm to 9pm. This event appears not to be advertised online yet, so I’ve parked the information on London Historians web site, here. (pdf document). Yesterday I popped into town to catch up with two exhibitions: Threads of Feeling at the Foundling Museum in Bloomsbury; and Thomas Lawrence: Regency Power and Brilliance at the National Portrait Gallery. The former has already been beautifully covered by Emily, here, so I shan’t dwell on it overmuch. I would just say that this was my first visit to the Foundling Museum and like Sir John Soane’s Museum, it is one of the lesser-known treasures of our city. If you haven’t been, do yourself a big favour and go. The walls are dripping with paintings, the rooms are lovely and apart from the deeply interesting stuff on foundlings, orphans and social history from mid 18C, there is plenty to learn about Hogarth, Handel and the institution’s founder, Captain Thomas Coram. Being a big fan of William Hogarth, I was delighted to catch up at last with his March of the Guards to Finchley. 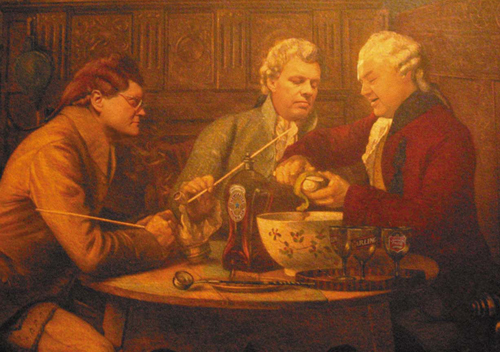 There is also a fine Hogarth portrait of Captain Coram himself. An extra bonus was that an 18C style quartet were practising. Old piano-like thing (spinet, harpsichord? ), cello, violin and what appeared to be a giant recorder. You must excuse my ignorance of old classical instruments. But it was lovely. On to the National Portrait Gallery. The new Thomas Lawrence show has already been widely praised in the press, and rightly so. The minute you walk in, your are struck by the man’s effortless talent. The exhibition features about sixty portraits of the great, if not the good, of Britain and Europe, from the 1790s through to the 1820s. One cannot imagine a single subject being less than delighted with Lawrence’s efforts. Obviously idealised, the works are executed beautifully, Lawrence skillfully capturing the essence of his sitters. The women are all slightly haughty, beautiful, knowing, with stunning hair-dos. The men all appear as they would like to see themselves: powerful, confident and wise. What is particularly striking are the clothes and jewellery and how masterfully Lawrence did them. The fur, the leather, the embroidered silks, showing their wearers to be dripping in wealth at the pinnacle of the social scale. Such a contrast if you’ve just come from the Foundling Museum. Some of the pictures were incomplete and you can see Lawrence’s effortless prepatory lines on the bare unpainted canvas; others were simply drawings in black, red and white charcoal: understated by comparison with the big oils, they are none the less delightful for that. I have two favourites. Mrs Manners, an aristocratic old dear, seated. You do not want to get on the wrong side of her. 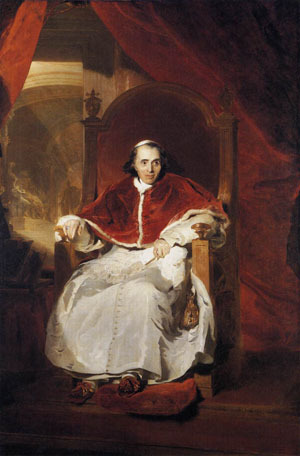 And Pope Pius VII. This is one of the few Lawrences, where the subject looks vulnerable, but it is magnificent and easily rates alongside Velazquez’ Innocent X (my all-time fave) and Raphael’s Julius II. when an Englishman could still enjoy tobacco in his favourite hostelry unmolested by the Law, I used to meet my good friends Dave and Will every Friday evening after a hard day’s toil. This was our routine for probably as long as ten years. Ten years of quality sneering at politicians, telly, religion, celebrity and sport. Ten years of luxurious wallowing in literature and history. Such larks. We mostly used the George IV, Chiswick, the Red Lion, Ealing or the Wheatsheaf, Ealing. When I wrote about prisons recently, I did not include compters, simply because I was unaware of them. Shortly afterwards I was at a talk at Camden History Society, at which the speaker, in passing, mentioned these institutions. Compters – sometimes called counters – were small prisons for minor transgressors such as debtors, religious dissidents, drunks, prostitutes, homosexuals and asylum-seeking slaves. But their inmates were overwhelmingly debtors. They existed from medieval times and were all closed by the mid-19C, their inmates being dispersed to other institutions. London had two compters north of the river (Wood Street and Poultry) and one south (Borough). Wood Street was preceded by Bread Street until 1555 and succeeded in 1791 by Giltspur Street, but essentially the heyday of compters involved the three mentioned. Compters were run by a sheriff and his staff, all of whom were essentially a law unto themselves, parliamentary inspectors having no jurisdiction whatever within the walls. They charged inmates for everything essential to survival and comfort: food, drink, clothes, bedding, warmth, medicine – the lot. Many prisoners – by definition already having money problems – often found themselves in a downward spiral of increasing poverty and squalor. In theory they could take in work from outside – tailoring, shoe repairing and the like – but this seems rarely to have happened in practice. At their height in the 17th and 18th centuries, compters would often lose half a dozen inmates per week to disease, but there was on shortage of re-supply. These institutions were notorious even in their own time with constant complaints from reformers and former prisoners via Parliament, newspapers and pamphleteering, to little avail. An Act of Parliament was passed in 1712 designed to aleviate the plight of demonstrably irredeemable debtors – it had little effect. It was not until the groundswell of Victorian reform was sufficiently powerful that compters were finally shut down for good in the 1850s. 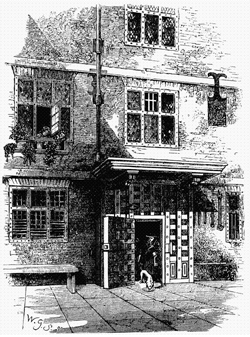 …when a gentleman is brought in by the watch for some misdemeanour committed, that he must pay at least an angell before he be discharged; hee must pay twelvepence for turning the key at the master-side dore two shillings to the chamberleine, twelvepence for his garnish for wine, tenpence for his dinner, whether he stay or no, and when he comes to be discharged at the booke, it will cost at least three shillings and sixpence more, besides sixpence for the booke-keeper’s paines, and sixpence for the porter. ..
Wood Street Compter was burned down in the Great Fire and rebuilt within a few years. 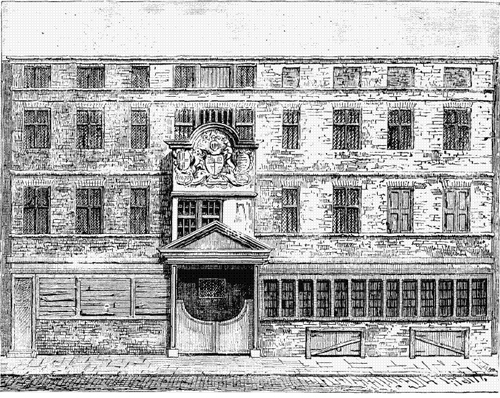 It was eventually closed in 1791 and its inmates transferred to the new Giltspur Street Compter. Poultry Compter was pulled down in 1817. Borough was the only compter south of the river. Originally in Borough High Street, it moved to Tooley Street in 1717. It was overwhelmingly a debtors prison, but held a small number of proper felons over the years. It was closed in 1855, almost simultaneously with Giltspur Street, bringing an end to the era of compters. The newest of the compters, Giltspur Street opened in 1791, replacing Wood Street and absorbing some of Poultry’s inmates when that institution closed in 1817. It was based in Smithfield, opposite Newgate Prison. There was a plan to convert the compter into a full-fledged prison in 1819, but nothing came of it in the end. Giltspur Street was eventually closed in 1853 and demolished two years later. The best source I found, drawn on heavily here, is Old and New London, Vol.1 (1878) by Walter Thornbury, re-published online by British History Online (sponsored by the Centre for Metropolitan History). The bits about Wood Street Compter and Poultry Compter, as linked here. 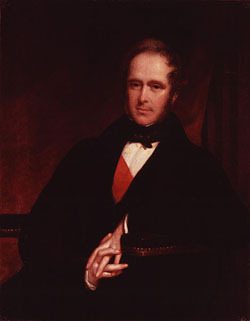 Lord Palmerston By John Partridge. ©National Portrait Gallery, London. *Not currently on display. It was Palmerston’s birthday the other day, but I was too busy to do a post in tribute. They say that Eton has the most Prime Ministers, but Harrow has the best (Churchill, Palmerston). I’d go along with that, especially of late! Ever since I read how he fictitiously called Flashman in to see him about a secret mission (Flashman and the Great Game), I have maintained a passing interest in Palmerston, wrongly in my view overshadowed historically by Gladstone and Disraeli. Perhaps the seeds of this were sown in his own time when he was seen as being frivolous due to his light-hearted and jokey personality, although he was well-able to deliver a five hour speech in the House when the occasion demanded. Henry John Temple was born into the Irish peerage in 1784 and succeeded to the title 3rd Viscount Palmerston before his 18th birthday. But his birthplace was Westminster, appropriately, and hence he is a “Londoner of Note”. “Pam” served as Prime Minister almost continuously for ten years from 1855 to 1865, dying in office a few days short of his 81st birthday. Prior to that he had been a Cabinet Minister as Secretary for War and Home Secretary since 1830. He was an MP for 58 years as both Tory and Whig, as well as playing midwife to the newly-formed Liberal Party. Palmerston is best remembered for his fierce patriotism: he disdained anyone who (rightly or wrongly) stood up for the other side. In foreign affairs he was always on top of his brief, having a deep – almost intuitive – understanding of its complexities, and certainly there was plenty of those mid-century. He has been characterised as being an agressor which many confuse with being war-mongering, which is not always the same thing. Some historians assert that had his colleagues supported his recommended course of muscular gunboat diplomacy against Russia, the Crimean War quite probably would not have happened. Yet once the die was cast, Palmerston backed and prosecuted the war in full and was the most vigorous in setting the hardest possible terms on Russia post bellum. He was fiercely anti-slavery, yet was in favour of the Confederacy during the American Civil War, for different reasons. He distrusted the Union states in North America, feeling that a strong United States would be bad for Britain in the long term. He was right. He resented the support for the Fenian cause from across the Atlantic. And a full century and more later, they were still at it, with devastating consequences. Palmerston foresaw all of this. But it would be wrong to think of Palmerston as a foreign affairs one-trick pony: he kept his hand in other matters of state too. Constitutionally he was against extending the franchise, a matter over which he attempted to resign. In 1857, as Prime Minister, he pushed through the bill which established civil divorce in the teeth of opposition from Gladstone and others.Was this stand influenced by his own reputation as a bed-hopper? After all, The Times nick-named him Cupid. One is inclined to think not, rather it’s another example of his pragmatism. Palmerston was certainly not one of Queen Victoria’s favourites to begin with, but once Prime Minister, the pair got on famously. After Newton, Nelson and Wellington, Palmerston became only the fourth non-Royal to be awarded a state funeral. Although a septuagenarian, and since 1807 occupying the public stage almost without interruption, he contrives to remain a novelty, and to evoke all the hopes that used to centre on an untried and promising youth. With one foot in the grave, he is supposed not yet to have begun his true career. If he were to die to-morrow, all England would be surprised to learn that he had been a Secretary of State half this century. If not a good statesman of all work, he is at least a good actor of all work. He succeeds in the comic as in the heroic—in pathos as in familiarity—in tragedy as in farce; although the latter may be more congenial to his feelings. He is not a first-class orator, but an accomplished debater. Possessed of a wonderful memory, of great experience, of consummate tact, of never-failing presence of mind, of gentlemanlike versatility, of the most minute knowledge of Parliamentary tricks, intrigues, parties, and men, he handles difficult cases in an admirable manner and with a pleasant volatility, sticking to the prejudices and susceptibilities of his public, secured from any surprise by his cynical impudence, from any self-confession by his selfish dexterity, from running into a passion by his profound frivolity, his perfect indifference, and his aristocratic contempt. Being an exceedingly happy joker, he ingratiates himself with everybody. Never losing his temper, he imposes on an impassioned antagonist. When unable to master a subject, he knows how to play with it. If wanting in general views, he is always ready to weave a web of elegant generalities. Endowed with a restless and indefatigable spirit, he abhors inactivity and pines for agitation, if not for action. A country like England allows him, of course, to busy himself in every corner of the earth. What he aims at is not the substance, but the mere appearance of success. If he can do nothing, he will devise anything. Where he dares not interfere, he intermeddles. When unable to vie with a strong enemy, he improvises a weak one. Being no man of deep designs, pondering on no combinations of long standing, pursuing no great object, he embarks on difficulties with a view to disentangle himself from them in a showy manner. He wants complications to feed his activity, and when he finds them not ready, he will create them. He exults in show conflicts, show battles, show enemies, diplomatical notes to be exchanged, ships to be ordered to sail, the whole ending in violent Parliamentary debates, which are sure to prepare him an ephemeral success, the constant and the only object of all his exertions. He manages international conflicts like an artist, driving matters to a certain point, retreating when they threaten to become serious, but having got, at all events, the dramatic excitement he wants. In his eyes, the movement of history itself is nothing but a pastime, expressly invented for the private satisfaction of the noble Viscount Palmerston of Palmerston. Marx’s biography of Palmerston is on the Internet in full, here. 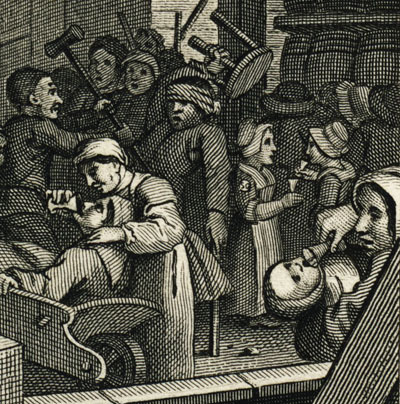 Celebrate Hogarth’s 313rd Birthday: Gin Tasting! 10 November 2010, 7pm – 10pm. Presented by Dr Stephen Parissien. Taste at least 12 different gins and learn about the history and process of gin-making. 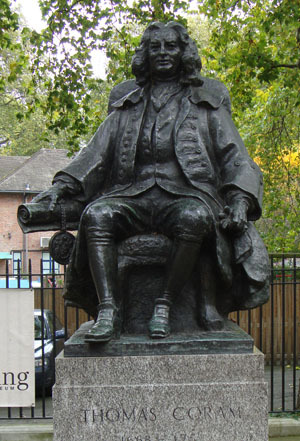 All proceeds towards the restoration of Hogarth’s House. For tickets please send your cheque with your name & address to the William Hogarth Trust, 52 Prebend Gardens, London W6 0XU. Places limited, don’t miss out!